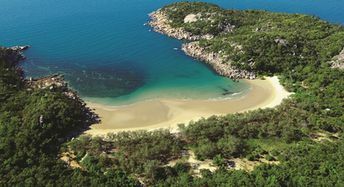 This island ranks #9 of the "Best islands in Australia"
Magnetic island has no many hotels, but there are also no many tourists. As a result, there are always free rooms, and fares are rather cheap in general. Fly to Townsville international airport (TSV). Next take a bus to the stop "Flinders St at Wickham Street" (routes 200, 201, 206). From Townsville Breakwater marina take a ferry to Nelly Bay of the Magnetic island. You may roam around the island by bus, or by bycicle, or just walk on your own. The best time for travel to Townsville in Australia is a dry season from April to November. That time sea water is relatively cold, but on the other hand you won't suffer from tropical rains.